“What therefore God has joined together, let no man put asunder.” (Matthew 19:4-6). A happy marriage usually contains happy people, better physical and mental health and a higher level of wealth. 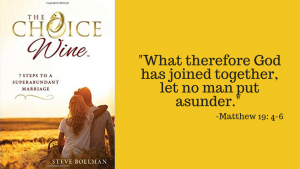 Author Steve Bollman (“The Choice Wine: 7 Steps to a Superabundant Marriage”) says if you follow the 7 steps, your marriage will have a foretaste of paradise. The last chapter ties everything together and Bollman explains how the steps parallel the holy family. He says God wished to give couples the superabundant joy that was experienced by man and woman in paradise. He doesn’t want us to have sufficiency, but superabundance – to truly thrive. 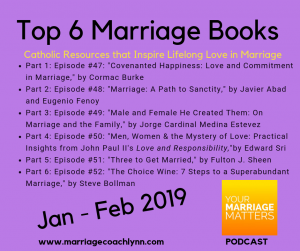 Here are the 7 steps: honor your wedding vows, use money for other people, give God some of your time, set your mind on things above, find God in yourself, find God in other people, make it easy to be good and hard to be bad.